This yarn from The Yarn Collective is one I have been eyeing for a while. It’s a plied 100% Merino worsted weight wool (somewhere between DK and aran for those not familiar with the worsted term) that has beautiful stitch definition, making it perfect for cables. The yarn comes in ten colourways, all named after and inspired by gems and minerals, and is hand-dyed in small batches to give amazing depth of colour. 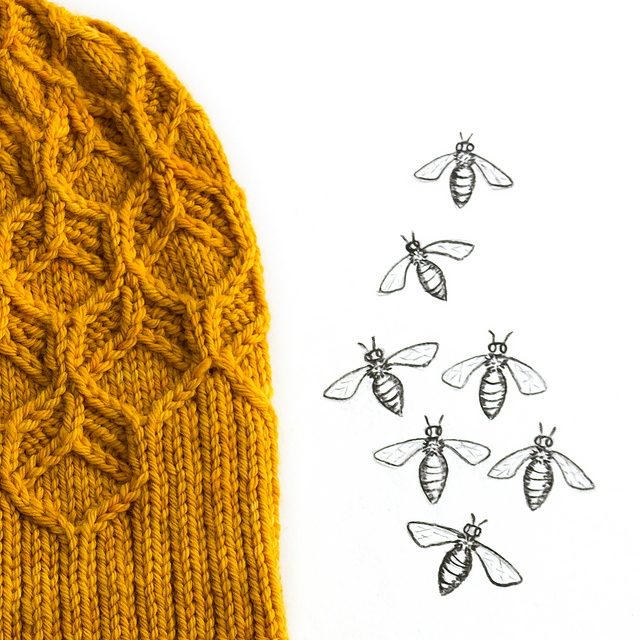 The yarn is beautiful to touch, it’s soft and bouncy, and the colour is really rich. One small reservation is that I found it hard to picture the colour from the shots on the website, as the colour samples are really small, which can make it hard to see what tones will be in the yarn when you receive it - the Bumblebee Jasper has a slight green hue to it on the website that isn't there in the skein I recieved (which is absolutely not an issue as I like the more yellow tone better!). What’s this yarn going to become? Probably a Beeswax Hat by Amy van de Laar. She’s running a KAL for the pattern over on Instagram and Ravelry over the next few weeks (July 28th to August 18th 2018), so I’ll be casting on for that. The yarn calls for DK weight, but my head calls for a slightly larger hat, so I’ll play about with the gauge and make it work as the colour is perfect! The yarn has 30% off in the sale, taking it to £11.83 for 100g, which is very reasonable for hand dyed yarn. I am always keen to try out different sock yarns, and while I’ve used Cascade Heritage Solids* in the past, I’d not tried the prints, so thought this would be a good opportunity. I am a sucker for bright colours, and the pink and purple in this yarn really leapt out at me on the website. The yarn is the same base as the Solids (75% Merino wool, 25% nylon), and you get a full 400m of sock yarn per 100g ball, which means you should be able to get a full pair of adult sized socks out of a ball. The yarn has a nice twist to it, and that in combination with the nylon means it will be good and hard-wearing. It’s also super-soft, which will make it perfect for even the most sensitive feet. To be honest, I am not 100% sold on the colourway - it has three solid stripes and two fairisle-style ones, but all the solids are next to each other, which I think will annoy me; I’d prefer the solids to be alternated with the fairisle. I do always have socks on the needles though and this will make an excellent choice for my socks for the Winwick Mum Yarndale Sock Line, so I’m going to knit it up for that. Selected colourways of this yarn have 25% off in the sale, taking them down to £6.74. **Love Knitting supplied the yarn to me to review for free; all opinions are my own.